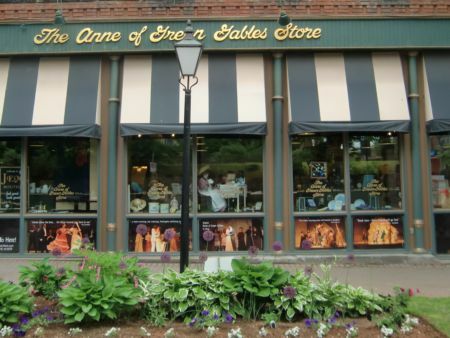 Say Prince Edward Island (PEI) and you are likely to get a “Kate Middleton and Prince William went there” reaction. 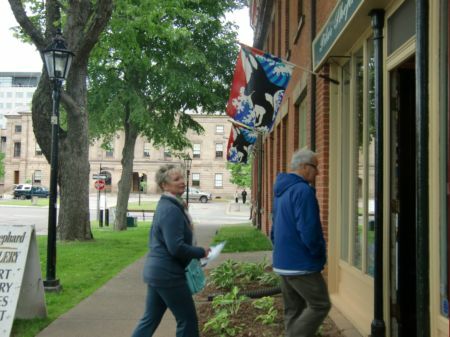 But we were looking forward to disembarking our cruise ship at Charlottetown, the island province’s main port, long before we knew that the Duke and Duchess of Cambridge, Kate and William, had included the town on their North American itinerary. Our agenda was to take time to see the small, charming “city” of 32,000 people. Tip: fans of Lucy Maud Montgomery’s “Anne of Green Gables” would want to arrange a tour to the Anne of Green Gables Museum and the Green Gables homestead. We did have help getting around from “Ambassatours,” a hop–on hop-off pink, (for cancer donations) imported, London double-decker bus operated by the Gray Line. Visitors can first board the pink bus at the pier or at any of its stops. The assembly room where political leaders meet. It is not the legislative chamber. First stop for us was Province House where the historic conference that led to the Confederation of Canada took place in September 1864. Political leaders from the three British maritime colonies of New Brunswick, Nova Scotia and Prince Edward Island (then St. John) and from what at the time was known as Canada but was comprised of the provinces of Ontario and Quebec, gathered at Province House to discuss uniting the region as the Confederation of Canada. 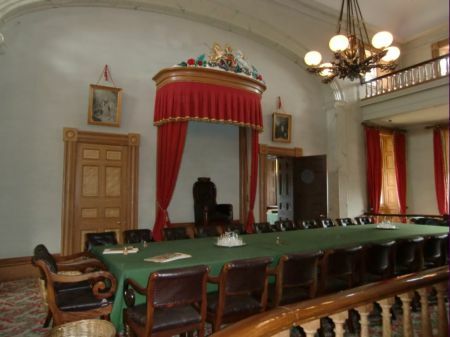 After visiting Province House and seeing “The Great Dream,” an award winning video on how the City of Charlottetown, capital of Prince Edward Island, was Canada’s birthplace, we understood why the royal couple might want to stop there. However, Kate is also said to be a Green Gables fan and Prince William was to take part in a helicopter exercise off PEI’s north shore. Aside from the movie, the structure is an 1847 sandstone building worth a visit for its neoclassical design, Legislative Council Chamber and period rooms. It is the seat of the Provincial Legislature. Instead of hopping back on the bus we enjoyed walking past the row houses dating to the mid-1800s on Great George Street. 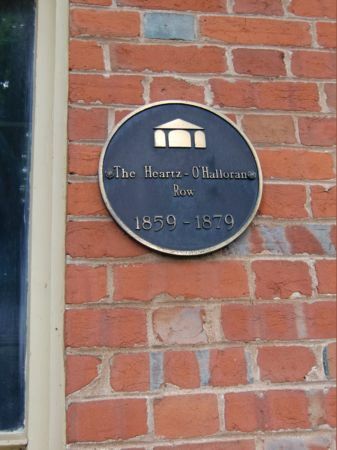 Most of them sported plaques on the outside and housed art galleries and cafes inside. I could have browsed the beautiful Inuit and other native art at Pilar Shepherd Art Gallery for at least an hour but our goal was St. Dunstan’s Basilica across the street. The Basilica’s twin gothic spires seen from a distance first drew us to the street. 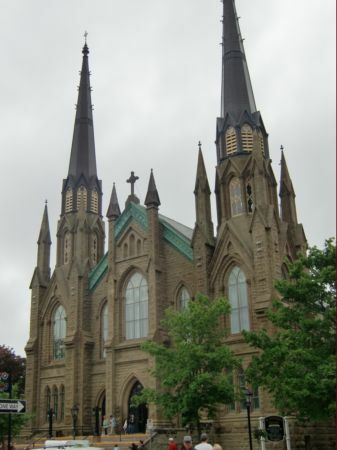 Then we learned St. Dunstan’s is known for its Italian carvings and is among Canada’s largest churches. Afterwards, we hopped back on the bus which wound around shops, historic inns and Victorian-style residences. 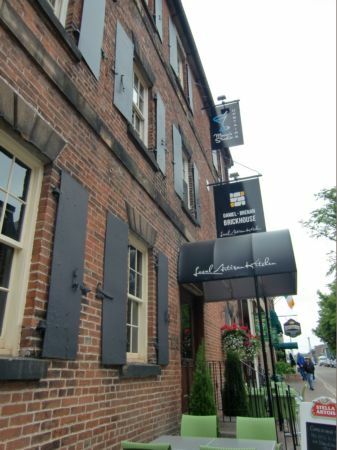 When we reached an area of inviting pubs we hopped off to find ourselves down the block from Province House on Queen Street and Victoria Row, a short street that was pedestrians only. In front of us was a store that specialized in Green Gables dolls, books and whatnots. But first, lunch. It was already 1 p.m.
Home to the International Seafood Festival, the island is the place to eat lobster, oysters, and mussels. We found fantastic mussels in a light curry sauce at Daniel B. Brickhouse, an artisan kitchen that specialized in organic and local ingredients. Food and wine encouraged lingering and dispelled the “If it’s Tuesday it must be Belgium” sense we had started to feel. Tip: When downtown Charlottetown stop for yummy ice cream at Cows Creamery. A pink bus will take visitors out to the factory-store where they can watch the product made and get a sample but if short of time, the downtown store is a good substitute. The ice cream and the cones are worth putting a Cows store on the visit list. 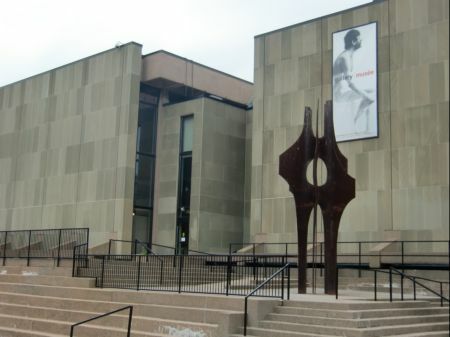 Then it was back to Victoria Row where the Confederation Art Gallery was housed in the Confederation Centre of the Arts, a modern building complex that also contained a library and entertainment venues. The arts center was next door to Province House. Back outside, we ran to catch a pink bus just before it pulled away from its Province House stop. We had little time to do the rest of the bus loop before returning to the pier. On board, we passed the Boardwalk, a popular waterfront area where restaurants, museums and shops jostled for prime harbor views. As our bus whipped around town we saw places we would liked to have seen close up such as Beaconsfield, a historic 1877 Victorian mansion, and Government House where the royal couple might stay as guests of Lt. Gov. Barbara Hagerman. Also on the route were inviting B and B’s and inns that convinced us PEI would be a place to come back and stay a while. Maybe next time we would be able to stay a while and explore PEI’s famed red beaches and play golf on the scenic courses along its shores. And I would dent the budget with something from the Pilar gallery.